Skywatcher Chris Schur was able to glimpse Comet Linear 252P with his naked eye just after capturing it on camera. The image was taken from Payson, Arizona on the morning of April 2, 2016. 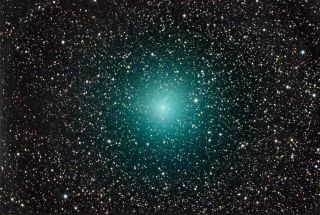 Skywatcher Chris Schur was able to glimpse the comet in this stunning image with his naked eye just after capturing it on camera. The image is of Comet 252P/LINEAR as seen from Payson, Arizona on the morning of April 2. "While it was exposing, I did get to look at it with binoculars and it was so easy," Schur told Space.com in an email. "I was just able to glimpse it naked eye as well, but it was tough." On March 21 of this year, Comet 252P/LINEAR made a close flyby of Earth, coming within 3.5 million miles (5.6 million kilometers) of the Earth. It was fifth closest comet flyby of Earth in recorded history, scienitsts said. "A very rich star field and deep cyan color highlights this image. An interesting feature of this comet is that the blue image was brighter than the green one," Schur added of his view. Shortly after Schur observed 252P/LINEAR, NASA used the Hubble Space Telescope to snap images of the comet on April 4. Those images showed a active jet on the comet as the icy wanderer tumbled through space. Comet 252P/LINEAR was discovered on April 7, 2000, by researchers from the Lincoln Near Earth Asteroid Research program (an MIT Lincoln Laboratory program funded by NASA and the U.S. Air Force). The comet's core is estimated to be 750 feet (230 meters) across. 252P/LINEAR was one two comets (2016 BA14 was the other) that made back-to-back close Earth flybys on March 21 and 22. Comet 2016 BA14, which was discovered this year, flew by Earth at a range of 2.1 million miles (3.4 million km). Astrophotography details: To make this image, Schur used a Meade 622 Cometracker Astrograph with a Baader MPCC coma corrector lens for his SBIG ST10XME camera, which was set at a 39-minute exposure.